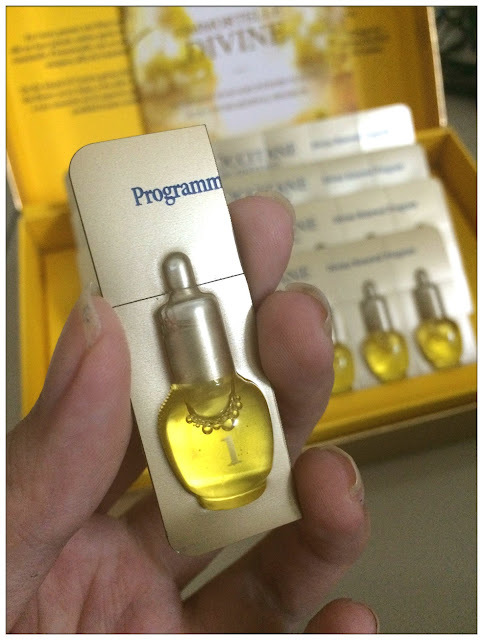 Divine, Immortality, Regenerate, these are the terms to describe L'Occitane's Divine Immortelle Renewal Program which I tried some time ago. It is an exquisite skin renewal program meant to use once or twice per year, is a tailor-made solution for overworked skin like mine, who always have their makeup on and no time for proper facial. Divine Skin in just 4 weeks! As time goes by, cells that make up the epidermis skin layer regenerates in a slower pace, so when it comes to stressful condition and environment, my skin condition become worst. 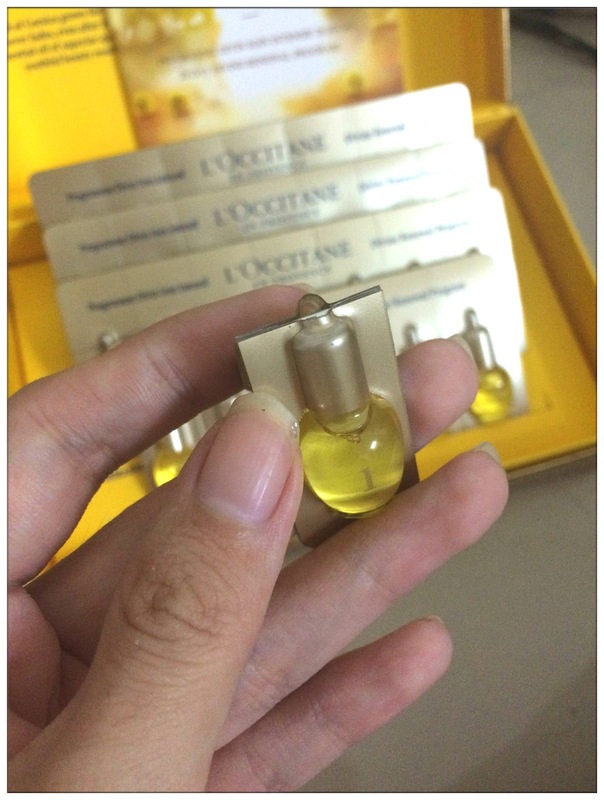 L'Occitane Divine Renewal Program is just what me and other women around my age needs, to speed up the cell renewal progress for a youthful looking skin with slowed down skin ageing process. 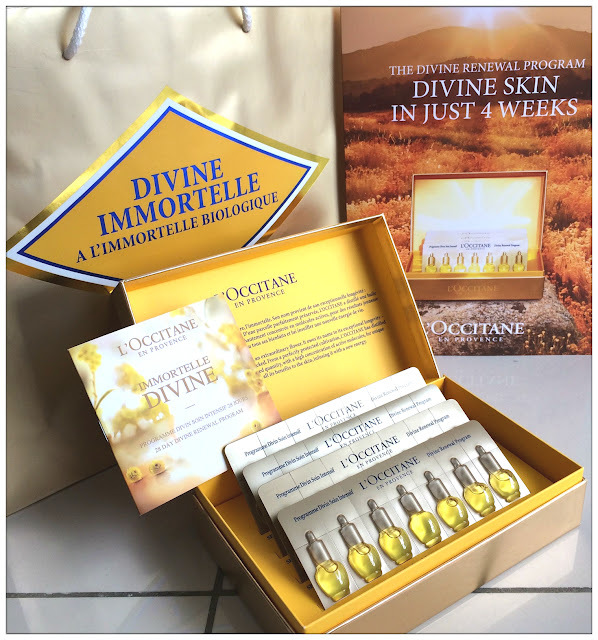 As our skin cell renewal cycle takes about 28 days time, L'Occitane laboratory developed this 28 Day Divine Renewal Program to harmoniously sync with our skin's natural rhythms while working its magic. Immortelle - a flower that never fades even after it has been picked, is the "Golden Sun" of Corsica Island. For over 10 years, L'Occitane patented this exceptionally anti-ageing power Corsican Immortelle and 5 patents pending for the Immortelle range L'Occitane products. 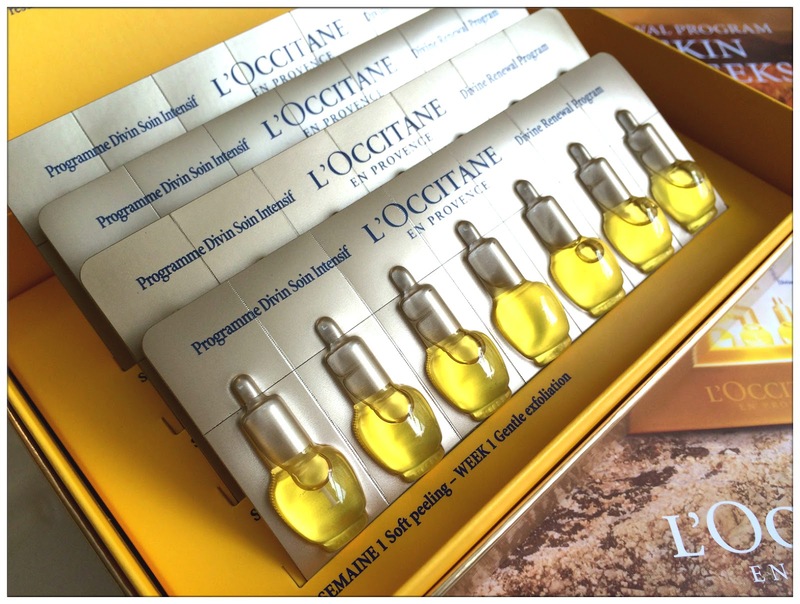 From planting, distillation, L'Occitane has set up a large scale Corsican Immortelle program with Corsica producers, over 50 hectares of Immortelle were planted and farmed organically on this sunny island. With the greatest respect for the environment, harvesting is done by sickle while weeding is left to the sheep. The growing condition of these Immortelle flowers are similarly like those in the wild, hence the rare essential oil of Immortelle flower is in limited but superior quality with high concentration of active molecules for youthful beauty result, infusing skin with new energy. Pistacia Lentiscus (dioecious evergreen shrub or small tree of the pistacio genus) essential oil for the first week act as gentle exfoliator by encouraging natural shedding process. The skin surface appears smoother. complexion looks more even toned. 4 plant oils with cistus essential oil nourishes and moisturizes the skin which later skin texture appears intensely hydrated and transformed. The combination of myrtle and rosemary essential oils with rebalancing properties, contribute to the overall skin's well-being. Skin feels stronger, strengthened and all prepped for the final stage of the program. Combination of carrot, cypress and immortelle essential oils combats the sign of ageing, skin is smoother, plumper, well-balanced and seems to be regenerated. The essential oils are held in easy-to-use, daily, single use dosage. Following the right order, I apply this 28 day divine skin renewal program before my moisturizer every night after cleansing and toning. At first I thought it's gonna be greasy on face, but the ultra-natural oil textures absorbed into skin right after I apply them on my face with some upwards-massage movement. It is advisable to apply the oils during evening/night as it is most conducive to cell renewal during that time of the day because skin is relaxed and more receptive to skincare products. I've been using the product for 28 days continuously and when I look back at the photos ( like above) and compare to my face current situation, I saw the difference. 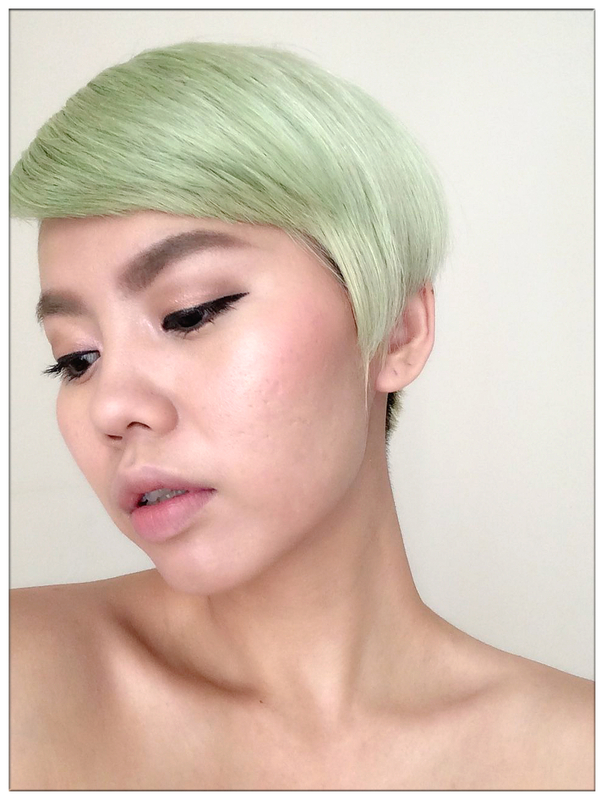 My skin looks luminous and healthy with hydrated look, where the glow can hardly be seen nowadays. It truly is a good cell renewal program to let my skin cell regenerate in a faster pace and I really love how glowy I look back then. I hope that maintaining this program once a year and the youth of my skin will look everlasting like the "golden sun" - Immortelle flower of Corsica Island.